After Christmas the spirit of happiness remains in Azuero. When the night of the New Year is approached, is noted the clamor in all the homes. 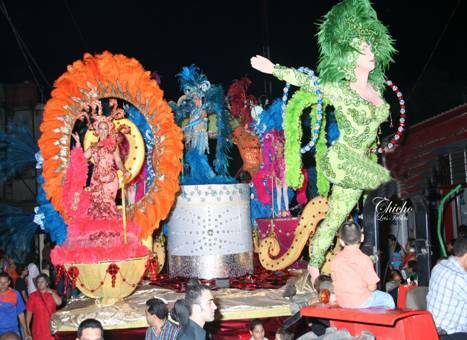 When the New Year arrive, it is given an introduction to the carnival of Las Tablas, in which resembles a night of carnival in the month of December in the dawn the first day of January. In the Festivals of New Year in the City of Las Tablas, there is a tradition that from the 12:00 am of the early morning of January 1 st, people approach to the park of the locality after celebrating in their homes and to eat their rich and traditional foods, to witness with a lot of happiness the spectacle that offer the tunas of “Calle Arriba” and “Calle Abajo”. Both “tunas” come out with their respective queens in allegorical carriages, so much the queen of last year as the new queen, and its happy streets bands executing melodies or songs of the previous carnival and people with a lot of clamor and revelry sing and shout the traditional controversy songs or “pullas” dedicated to the contrary “tuna”. All this feast is performed until almost leave the sun. In the afternoon of that day (1 st of January) is carried out some “culecos”, similar to the carnivals, with the queens in allegorical carriages, dressed with gaudy disguises, the happy streets bands, the cisterns cars in the park wetting to the participants of the “culecos”. At night, typical dances and discotheques in its respective places are carried out. A typical New Years float on the Azuero Peninsula. Panama loves its celebrations. These are times for socializing with friends and family. The Azuero Peninsula takes great pride in its celebrations, pulling out all the stops. Panama is a great investment opportunity as well as a place to truly experience one of Latin Americas more fun cultures.